Very happy that a few weeks back Bae Yong Joon and KE staff took time to visit KHJ in the military. It seems KHJ asked BYJ for some sushi, which they enjoyed together. This is the first time I hear of a celebrity publicly ....I mean being in the open...about visiting HJ. I'm sure many past friends and acquaintances of HJ wouldn't be caught ---- being seen together with him these days. Oh well...BYJ has shown his held-fast friendship with KHJ before this, so I'm not too surprised by this visit. 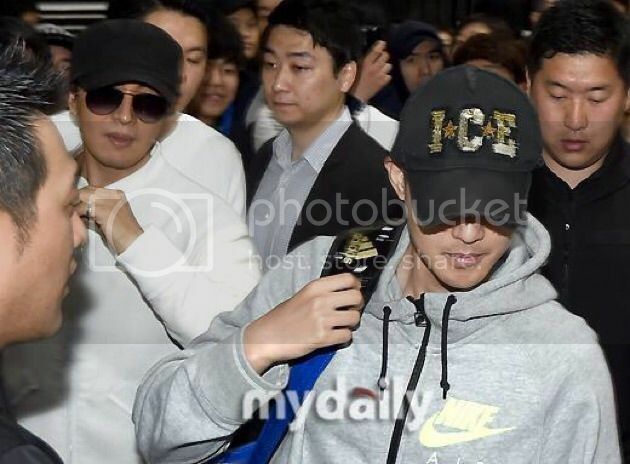 Many fans and people have been putting down BYJ and KE in connection with KHJ's case, deeming them doing nothing or not enough. I haven't. Not many shareholders of Entertainment Agencies in S.Korea would do this, hands on protecting, accompanying and taking care of a talent in the agency to this extent. I choose to believe they have a good relationship and that BYJ and KE have Hyun Joong's best interest at heart. True or not, I guess time will tell. Fans have been doing a lot in supporting HJ in the military. As I don't have the funds to do that, the least I can do for HJ is to keep believing in him and keep defending him and setting things straight from here...my blog. Hi Sunflower ! I'm glad to see you're still hang'in around here^^ Yes I want to do what I can, just feel it's so unfair, the way things are going with the trials. So sad to think he hasn't seen his son [if this is the case]. True fans are precious to KHJ right now...more power to KHJ and us ! I also want you to know how much I admire your photography. What beautiful shots and great composition. Thanks. Have you seen the reports on paternity and custody case? All K-pop has an article and Lazerkim has been posting. This looks like progress. Also the civil court case has been scheduled for June 3. His witnesses have been accepted but not hers. Encouraging!